We all know the Christmas drill: Never-ending parties end right on time for Simbang Gabi, after which, you head straight for work, and then straight for another get-together and the vicious cycle continues. By the time Christmas day rolls in, with a trail of alcohol and fatty food at your heel, you look like death. 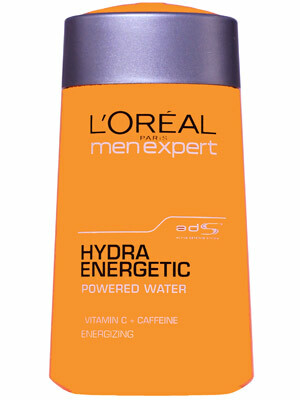 Fortunately, L'Oreal has a line of products to try and stop that. The Expert Hydra Energetic Skin Care Range has four products: The Hydra Energetic Skin Awakening Icy Cleansing Gel, the Hydra Energetic Powered Water, the Hydra Energetic Icy Eye Roll On, and the Hydra Energetic Multi-Action 8 Gel Cream. We know applying all four every single day won't be helping your objective to look good this Christmas. So, like the slothful minimal lads, we picked the two products from the line we think we'd be able to make a sustainable habit of. Sort of like replacing hilamos with better products, instead of adding more to it. The Hydra Energetic Powered Water (P139) is the first powered water from Men Expert fueled with the best energizing actives of skin care. Instead of your usual soap bar, how about washing your face with this? The formula, which contains vitamin c and caffeine, delivers intense hydration—24-hours, in fact— energizing your face, pronto! Yup, parang ginigising ang mukha mo! This is great for mornings after inuman, when you are especially dehydrated and your face looks bleh. There's a new Fragrance from Diesel!